I worked for many years with Harry Siitonen at the SF Chronicle before his retirement. He was always a stand-up man, with true principles of justice. He was a loyal member and activist in the union, while never holding back on his views if he disagreed, or agreed(!) with the leadership. 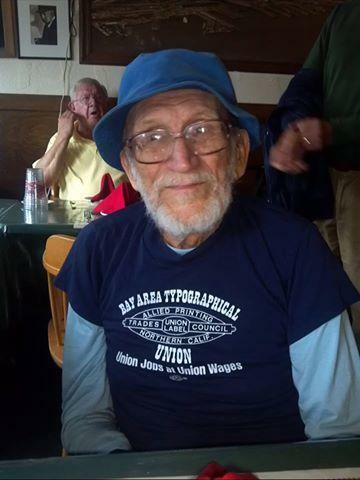 This photo was taken by Harry’s good bud & comrade Antonio Salas at the Bay Area Typo Union Retirees Club at Double Play Bar & Grill in San Francisco on October 17, 2015. Welcome to Harry Siitonen’s “Finn Labor” Website. We begin with Harry’s memoirs, which you may view by clicking on the link above. 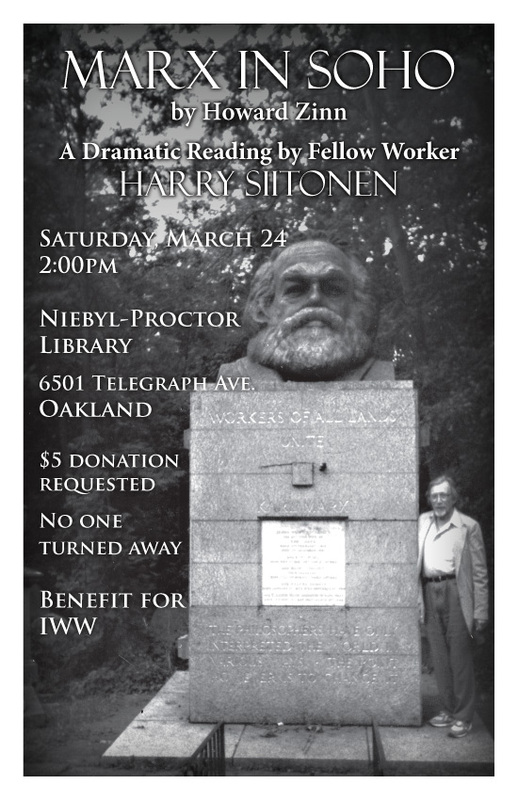 He also has a brief history of the Finnish-American labor movement he’s delivered as a paper on a couple of occasions, and other articles he’s written could appear here. Harry had often thought of doing an on-line newsletter, which he would name “Finn Labor”, as that is part of his proletarian activist identity. It would be devoted mostly to information on the Finnish radical and labor movements, which are of special interest to him. Those are things in store. Harry is a fascinating individual, with a long and rich and radical life, with stories to share. I urge you to visit FinnLabor.net from time to time, just to see what’s up. Meanwhile, here’s an interesting link, just to get started: SASK — Trade Union Solidarity Centre of Finland. 3/25/2014: Harry has completed the sixth installment of his memoirs. Click HERE. 10/31/2013: This just in! Here’s a photo of Harry with Karl. 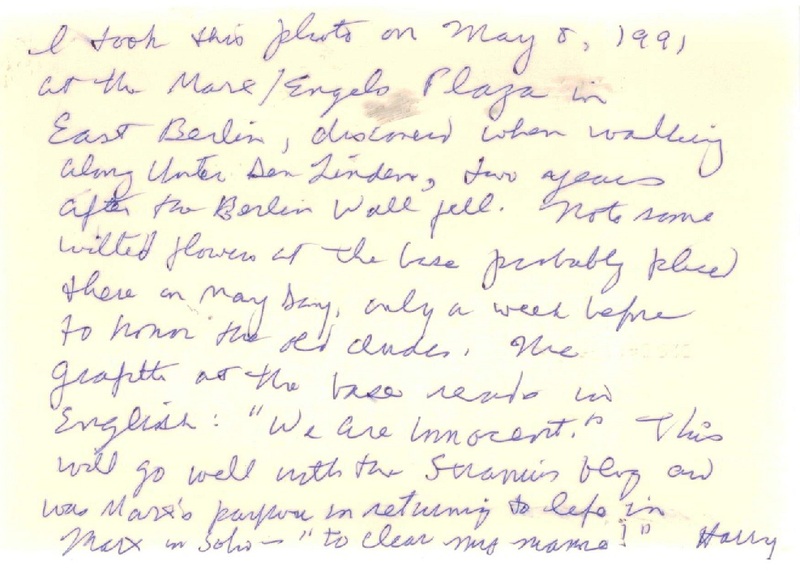 6/17/2013: Harry found his father, Antii’s thoughts on the existence of a god, written when he was 23 in 1912 (& Harry was just a gleam in his Mama’s lovely eyes. Read AJATUKSIANI, and Harry’s English translation. 6/8/2012: About 4 years ago Harry returned from FinnFest in Minnesota having delivered "Free Thought and Secularism in the Finnish Diaspora", one of the best talks he feels he’s ever given. There is a link at the top, in the navigation bar, but you can access it HERE. 3/25/2012: Harry appeared as “Marx in Soho” (official website for the play: www.marxinsoho.com/) on Saturday, March 24. He was terrific! There is a chance he will reprise his role in the City. Stay tuned. 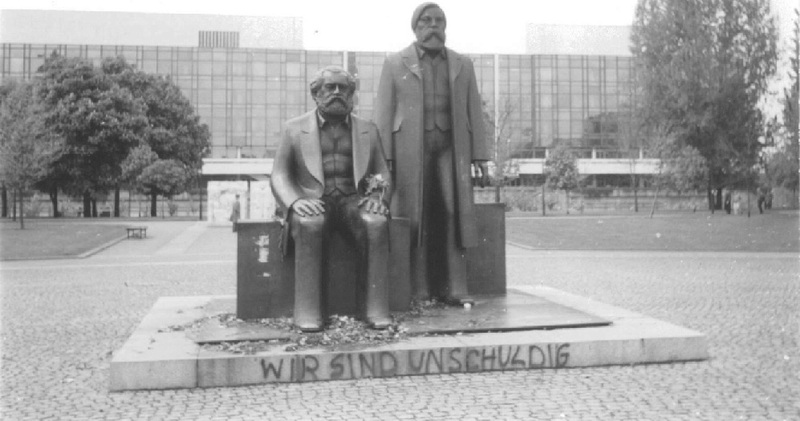 3/4/2012: Here’s a photo Harry took of the statue of Karl Marx, with grafitti, in East Berlin. 3/26/2012: Harry offers his translation of “When the Soviet Union Collapsed” By Finnish blogger Pentti Stranius. 10/5/2010: United Finnish Kaleva Brothers and Sisters Berkeley Lodge No. 21 Invites You to: An Afternoon of Finnish-American Poetry. Sunday, October 24, 2:00 pm. For details in PDF, click on: Poetry Reading. 8/9/2010 — Harry writes, “Hey Daniel: I wrote a little item on a Finnish anti-war song "Veli, Sisko", (Brother, sister) including its history briefly and its lyrics written by Elsa Rautee in 1936, plus a 2006 English translation by Tuomas Kaikkonen. Reijo Frank popularized it around 1969-70.” Check out: Veli Sisko. 7/8/2010 — Harry writes: Production has begun on a feature film, “Big Finn Hall” in Thunder Bay, Ont., about Finnish Canadian immigrant radicals in the early 20th century, directed by Kelly Saxberg, a descendent of these immigrants. Two Finnish professional film actors have been brought in to play the leads. The film will be based on actual historical events. Recently, the centennial of the Big Finn Hall was held, which still exists and includes a cooperative restaurant called “Hoito" . Finnish-Canadian members of the Industrial Workers of the World (IWW, Wobblies) owned Big Finn Hall for many decades. Plans are for a public showing of the film in the fall of 2011. See the online Helsingin Sanomat for a Finnish language story about the this film project. Hey, Harry’s in a cartoon! More from Harry’s Poetry Corner: “Name In Vain” Check it out. Harry’s been back to the aulde country. Check out this photo: Harry @ Suomenlinnaon. Cheers! Harry’s poetry corner. (Check out his recently-penned: What’s Immoral – (An alphabetized laundry list aspiring to become a poem). Sadly, Utah Phillips has taken the High Rail. Read Harry's Obit. 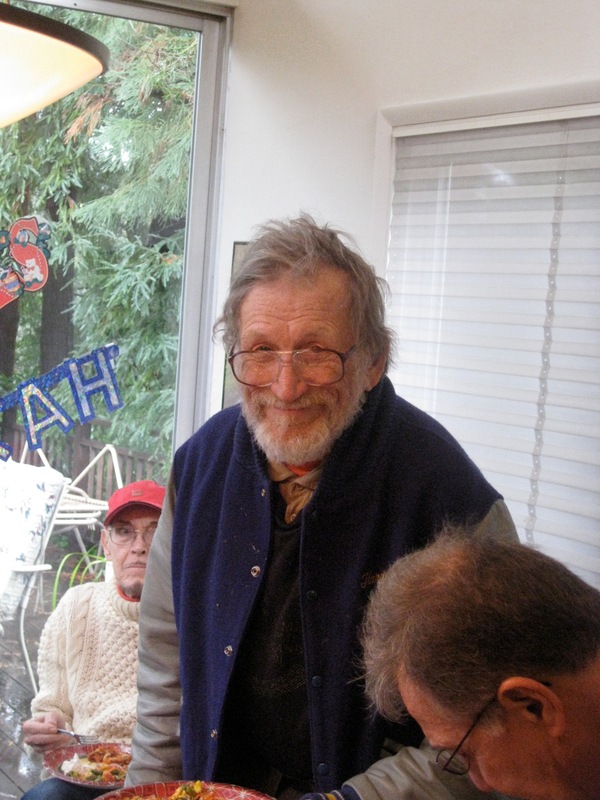 'Twas a wonderful send-off was given him at the Ashkenaz August 1st. Harry was there, and spoke, and was much music & merriment. His music and legacy live on.